Testing was done in 2010 on a sample of H. ‘Fried Green Tomatoes’ which displayed a “virus-like mottle symptom.” A standard hosta virus screening yielded negative results. After two years of observation, “non-standard” hosta virus testing revealed the cause to be Tobacco Streak Virus (TSV). For more, read the article HERE. The building fund drive for a new dream home for the Spece family is nearing the milestone needed for construction to start. Two special donations to the First Look auction in February provided a healthy boost to the total. Read the article HERE. Individuals and groups have raised funds in a variety of ways. In May, an online hosta auction with all proceeds going to the fund helped raise the total significantly. Recent developments have made it possible for construction to begin this fall with the hope that the family can be in their handicapped-accessible home by Christmas. Fundraising efforts continue. The Russ O’Harra Hosta Society (ROHS) observed its 20th Anniversary in 2013. The Society’s first meeting was in March 1993, and the members unanimously chose “Russ O’Harra Hosta Society” as the name. An Honorary Lifetime Membership was bestowed on Russ. Sadly, he passed away in 1997. ROHS members celebrated the milestone in July at the Iowa Arboretum, rural Madrid, IA, and the site of many of the group’s meetings throughout their 20 years. Hosta leaves have long been used as a part of floral design. In recent years, the leaves have inspired several Iowans to use them as food decoration. 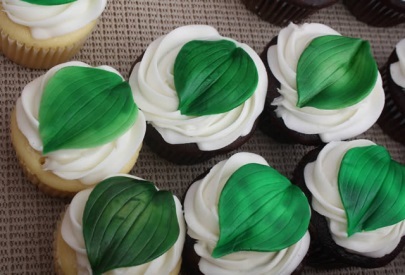 At In The County Garden’s annual Hosta & Dessert Social in June, cupcakes topped with hosta leaves made of frosting have been a hit for several years. Kathy’s Kakes of Independence, IA, creates these “sweet” leaves. Like hosta leaves, no two are exactly alike. Marie White, Parkersburg, IA, creatively uses fresh hosta leaves for “Hosta Occasions”. 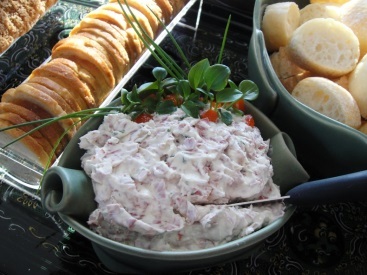 The first appearance was as a garnish in a dip at a gathering of hosta friends for the closing night of the 2012 First Look Auction. 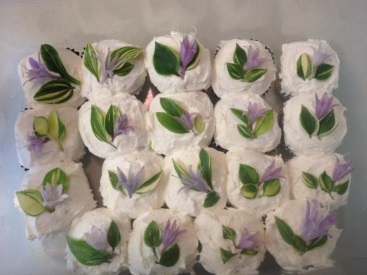 Next, she adorned cupcakes with leaves from hosta seedlings and hosta flowers for the fall meeting of the Harshbarger Hosta Society. 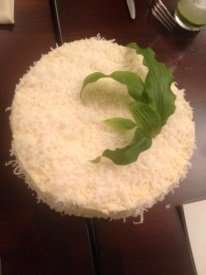 Then, for her six-month wedding anniversary with her husband, Jeff, she artfully arranged hosta leaves on a purchased white cake. A YouTube search for a cool video like the time lapse blooming of hosta flowers featured in the 2012 OLJ’s Divisions led to Hostas an Essential Guide. The first video was a promising start, but then I fell down the hosta rabbit hole via the internet. How to Care for Hostas: Gardening Tips: Soaking Hostas Prior to Planting. Click HERE to view a short video clip which suggests the benefts of soaking hosta transplants in water with B1 added for at least 30 minutes. The song “Sarajevo” by Loz Contreras (Hosta Remix), click HERE, falls into a hitherto unknown (to me) music genre called Drum and Bass Music. It proved to be a rather pleasing and relaxing form of electronic music with synthesized vocals. Hosta, the record producer, has a number of other songs listed, many with free downloads like “Lost Memories”, click HERE. A record producer/artist who calls himself Hosta was intriguing. I followed the link to his profile. Other than a photo confirming that the artist was male, the profile information was blank and there had been no recent activity on the account. Other song titles credited to Hosta included ‘You & Me’, ‘Lost Memories’, ‘All This Time’, ‘Left Behind’, and ‘True Love Is a Fairy Tale’ along with several collaborations listed as Jodi and Hosta. A quick check proved that Hosta the record producer did not exist in the realm of Wikipedia, but Hosta IS a German-based company which owns Droste B.V., a Dutch chocolate manufacturer based in the village of Vaassen, NL. Droste is owned by Hosta, but operates as an independent business unit and their sales have gone up considerably since the takeover by Hosta. A Google search for “musician Hosta” yielded a wealth of information and images. Hosta, the musician, has both MySpace and Facebook pages. A visit to website, “last.fm”, resulted in a surprise. There is not just one but THREE recording artists who go by the name Hosta! In addition to the young man listed as a UK Drum & Bass Producer from Newcastle (originally Manchester), there is also an electro musician from France, and a high-energy rock trio from Fayetteville, Arkansas who have been playing live dates in the Midwest since 2008. Hosta, the band, was featured as Band of the Week on Indie Rock Cafe on December 10, 2009. Their sound is described as a genre-bending mix of blues, ska, folk, and experimental rock. Three of the songs from their self-titled debut can be heard on the webpage, click HERE. Not only do recording artists use the name, but a song titled ‘Hosta’ has been recorded by Hannibal, a Slovenian musician, who is a member of Astrid Lindgren’s music group. According to the post, so far this is his greatest hit. As for the genre, let’s go with “Slovenian Hip Hop” – you be the judge, click HERE. Bike enthusiasts have a couple of hosta options on YouTube. To see a ‘single track bonanza’ handlebar view down forest trails at VERY fast speeds, Bližnja hosta, click HERE. He’s skilled at staying on the trails … when he chooses to do so. For those who prefer their bikes with engines, check out “Dad’s Walk Around His Bike” posted by Lyana Hosta, click HERE . Two garden-related posts on the YouTube page were both informative. Planning a cottage garden in a backyard was the theme of the nicely done “my personal park”, click HERE. “Fall Maintenance: Helpful Tip - Fall Watering the Perennials, Trees and Shrubs is a Must” offers useful information on watering in dry fall conditions and is filmed in a shaded hosta garden, click HERE. In case you’re wondering, bližnja hosta translated from Slovenian means near hosta. It would seem that American Hosta Society members are all bližnja hosta. Editors’ note: If you have short bits of news that would be of interest to our members, please send them to us. They can be assembled and edited to fit the space for us all to read.